I really love making wreaths. Their circular shape is so pleasing to the eye. You can make them without spending a cent and they can last for a very long time, either by choosing foliage and flowers that dry well, like gum leaves and hydrangeas, or by replacing the more perishable additions whenever they start to look too grim. As someone who loves to read articles called How to Boil and Egg and How to Fold a Fitted Sheet, I feel no shame in posting a how-to that will, for most, be in the realm of the obvious. Thanks to Ally from Minouche (seriously the most beautiful clothes for little girls) for asking me if I would share something for her soon to be launched project The Clever Collective, which will bring together all sorts of advice and how-tos. I can't wait to see it. And it was because of this I started thinking about the process of wreath making. First up, you need to create the base ring for your wreath and you can go natural or find something that is already round. For a natural base, it is hard to beat grapevine cuttings. It also helps that my neighbour has a very vigorous ornamental vine that requires regular pruning. I love the look of little squiggly bits that come off the vine and they make it very easy to work with, acting as a naturals fasteners. You just need a couple of lengths of grapevine. Hold one end in your left hand with your right hand about 2/3 of the way up the length. Bring your hands together to make a circle, clasp both parts of the vine where they meet to form the circle with your left hand and use your right hand to tuck the leftover length in and around the circle. It should be quite secure thanks to the squiggly bits. Then weave another length in and around the existing circle to sure it up. Et viola, you have a base that is beautiful as it is or ready to be adorned. At this point I like to add a couple of more permanent pieces. I bought a bunch of these large gum nuts about six months ago, they've dried beautifully and are great to use in a wreath. I particularly like to use these pieces in an asymmetrical, almost random way. Now you need to decide what part of the wreath you are going to fill: the full circle, the bottom half of the circle, the top half of the circle, the bottom half skewed to the right or the bottom half skewed to the left. Here I have filled the bottom half of the circle with May bush cuttings. There is something about the simplicity of this with just the white, greens and wood that I really love. Below I have swapped the May bush for something more ornate: some mini pink carnations, peach blossoms (maybe they are plum?) and some ranunculus. My daughter thought it would be a good idea to add a nest, so we did. As you can see we stuck to filling the bottom of the wreath, but brought in some asymmetrical movement with the blossom branches. In my opinion, it is these whimsical elements that bring a wreath to life. In the next version, I took out the ranunculus and piled in a heap of this lovely purple flowering weed, still sticking to the filling-the-bottom-half concept. 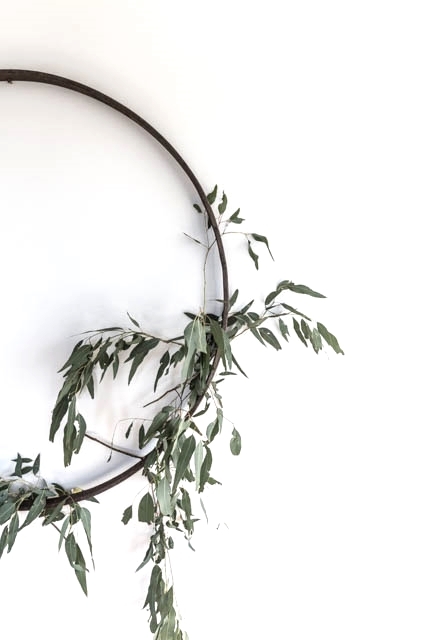 For this wreath below I used a huge rusty steel ring and with some string, tied on branches of gum leaves to the bottom of the circle, skewed to the right. I then added some big daisies, some small English daisies and some early yellow David Austen roses. I really like the negative space. In fact I think the bottom-half-skewed-to-the-right is my favourite layout. And here is another example of the bottom half skewed to the right layout, this time with grapevine cuttings. And finally here is an example of wreath where I chose to fill the whole circle. I just used young, bendy wattle branches and, making sure they ran in a continuous direction, tied them into a circle using zip ties (I seriously love zip ties, the sound, the ease, everything) and then filled it up with a few smaller pieces jammed into the structure. I would love to see your take on making a wreath. I have teamed up with Megan from Odgers and McClelland Exchange Stores in Nundle to run a fun instagram competition. The prize is a pair of beautiful flower snips from her store (I use these and adore them). To enter please post a photo of a wreath you have made using the hashtag #howimakeawreath and tag me @the_dailys and Megan @exchangestoresnundle . We will pick our favourite on Monday 28th September, I will share the photo on my feed and the winner will receive the snips in the mail. The only catch is that you have to follow both Megan and me. Cannot wait to see what you come up with!